"Good old" happy birthday wishes are certainly the way to go when you just want a classic birthday message that makes your loved ones feel special...like the birthday greetings here. That's because "happy" birthday greetings permit you to be inspirational without sounding preachy, sentimental without sounding syrupy, cute without sounding too cute or happy without sounding manic. They let you say a little bit of everything. And that's exactly what the happy birthday verses on this page can do for you and the birthday girl or boy. The very best wishes on your birthday and the other 364 special days of the year. Wishing you the happiest of birthdays from the bottom of my heart to the top of my mind...and back. Hope the birthday wishes you hold most dear come true in the coming year...for years to come! Sometimes, a little shove in the right direction helps you make a decision much faster. 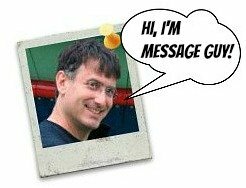 That's what Message Guy's helpful hints can do for you, as you look through the happy birthday messages on this page. Click here to see Message Guy's tips right now. May your birthday start and end with the belief that you are special...because you are! For every candle on your birthday cake, may you be granted a birthday wish that's guaranteed to come true. Best wishes for the most merry birthday and happy tomorrows. Happy birthday to the happiest person in any room, anywhere. Happy birthday. May this special moment in time lift you higher than you ever imagined. You are an amazing person. You deserve an amazingly special day. Happy birthday. ...deeply touch your heart. This is what we all aim for when we send birthday wishes to someone special. This is one of those happy birthday messages. Eat, drink, sing, dance, celebrate and be happy to the tune of whatever you moves you — it's your birthday, after all. Happy birthday. May your special day be truly the stuff of dreams. Happy birthday. May you always sip from the fountain of youth and essence of wisdom. Wishing you a spectacularly spectacular, wonderfully wonderful birthday. 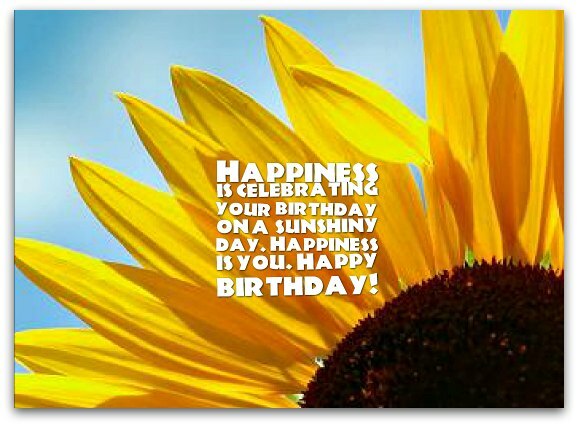 Happiness is celebrating your birthday on a sunshiny day. Happiness is you. Happy birthday! 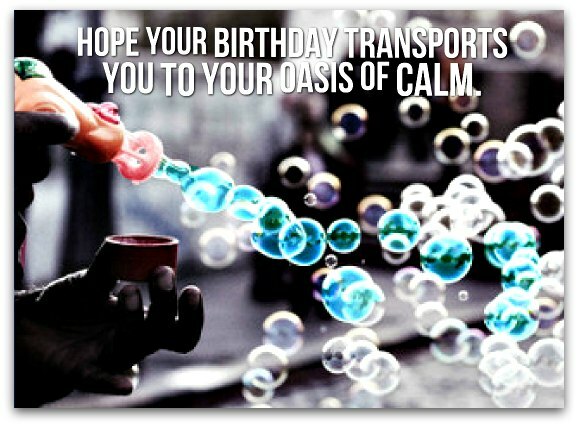 Hope your birthday transports you to your oasis of calm. May your deepest desires and wildest dreams take you further than you ever thought possible, starting today, your birthday!